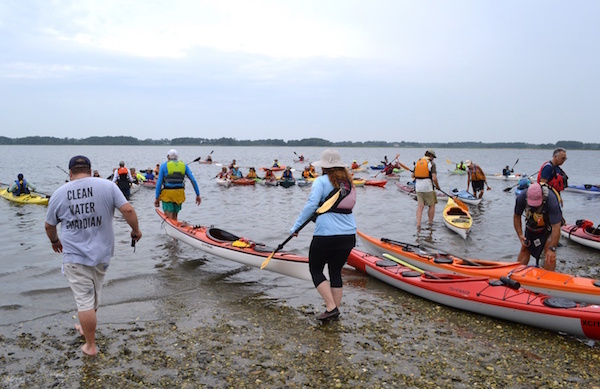 More than 40 kayakers and one standup paddleboarder hit the water Saturday, August 18, for a feat of endurance and activism in support of the campaign to preserve Plum Island. 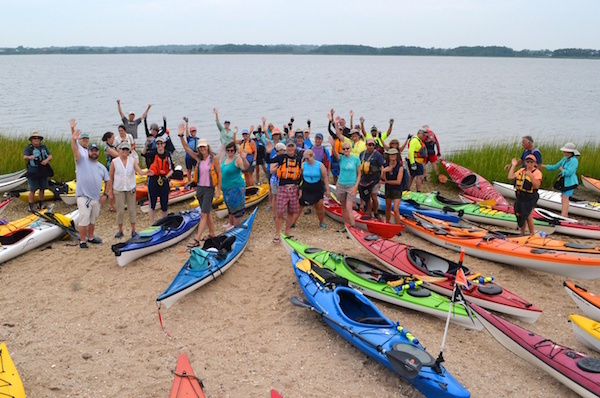 The first Paddle for Plum Island kayaking event brought together the Long Island Paddlers kayaking group and Plum Island conservation enthusiasts to raise awareness and funds to support Save the Sound’s work to preserve Plum Island from commercial sale and development. After photos were taken of the colorful display, participants paddled up through the park’s northern bays and creeks on a three-hour excursion. Following the paddle, participants gathered back at the park for an after-party featuring barbeque and a raffle with donations from local restaurants, farms, and other small businesses. The event raised nearly $2,000 to support Save the Sound’s efforts to lead a visioning process for the future use of Plum Island, once the Plum Island Animal Disease Center moves to Kansas by 2023. Plum Island is an 840-acre, federally-owned island in the eastern end of Long Island Sound, and home to threatened and endangered birds like the piping plover and roseate tern, as well as other rare species. Over 100 Connecticut, New York, and Rhode Island organizations work together as the Preserve Plum Island Coalition, partnering with grassroots activists and champions in Congress to halt sale of the island. Connecticut Fund for the Environment/Save the Sound brought an action in federal court in 2016 claiming that the government’s decision to sell the island violates numerous federal environmental laws; a judge ruled earlier this year that the suit could go forward. Will North Fork Bob Make It Home in Time to Nest?